HOST is a well-established charity which organises visits by young, inter- national university students to volun- teer families in the UK. Having a well-educated younger person from another part of the world visit you for a day, a weekend, or over Christmas, is an ideal way of exchanging ideas about your respective cultures. It’s an opportunity to take a pride in our own country and to understand more about another one, while showing kindness to someone far from home. It’s also great fun. If you’re not sure about doing this on your own, why not get together with another U3A member and make a great international weekend of it? To find out more, please see www.hostuk.org or call HOST 020 7739 6292. Note from Ed: Friends of mine have been happily hosting foreign students for many years, making firm friend- ships in the process. They have re- cently returned from the Far East having been invited to the wedding of one such student. or call local organiser Eric Songhurst on 01132 607270. UCL Division of Psychology and Language Sciences – Scientific Study: Levodopa and Speech Perception. Are you interested in taking part? DIVISION OF PSYCHOLOGY AND LANGUAGE SCIENCES Scientific Study: Levodopa and Speech Perception (£60) Are you intersted in taking part in scientific research? We are looking for participants for our 2-sessions speech perception study. Please contact Kim Coulson if you are interested or would like to know more: k.coulson@ucl.ac.uk 1.
Who can take part? Anyone who is a native speaker of British English, 30 years of age or older, with no history of neurological conditions, hearing impairment or drug abuse, and no current pregnancy. If you want to take part, we will do a short screening over the phone. 2. Is there any compensation for my time? You will receive a total of £60 compensation for your time and travel expenses. After the first session you will receive £40 and the remaining £20 after the second session. 6 months after the first session, we would also like to invite you to a third session and you will also be paid for that if you decide to take part. 3. What is it about and how long does it take? This study aims to understand how levodopa modulates speech perception. We hope that results from this study could improve speech perception in deaf people that have a cochlear implant. You will be invited to our lab, and will take part in a speech perception test after either taking levodopa or a placebo. What is levodopa? Levodopa is a drug which alters the natural levels of dopamine in the brain. It is widely used, mainly for the treatment of Parkinson’s disease. The average daily dose in adults is 3-6 g (3,000-6,000mg). You will receive a much smaller, single dose of 100 mg in order to avoid the occurrence of side effects. The study takes part in 2 sessions: the first one last 2.5hr and the second one lasts 2hr. In each session you will either take levodopa or a placebo. You will not know which one you were taking during the duration of the study. You will take levodopa at most ONLY in one of the sessions. We will also invite you to take part in a short third session after 6months that does not involve a drug or placebo. The study will be conducted at the Institute of Neurology, UCL, in 33 Queen Square. 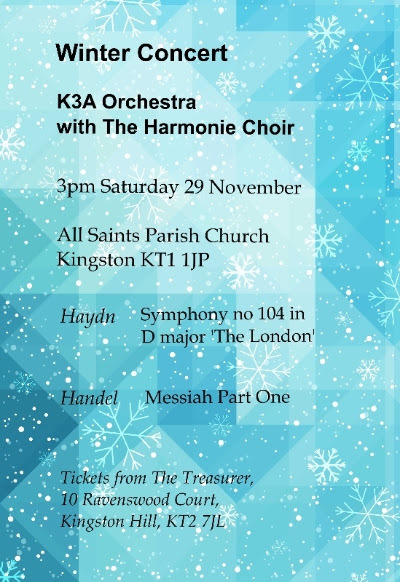 Our winter concert of late eighteenth century music will take place on Saturday 29 November at 3 pm in All Saints Parish Church, Kingston KT1 1JP. The programme will include Haydn’s last symphony, No 104, ‘The London’, composed in 1795 while he was living in London, This explains the name – although in fact altogether he wrote eleven other ‘London’ symphonies. We will be joined again by the Harmonie Choir for a performance of Part One of Handel’s Messiah, in Mozart’s arrangement. Handel’s original orchestration was for strings and continuo with occasional trumpets and drums. Mozart brought it up to date, to suit late eighteenth century taste, adding woodwind and more brass and timpani.